Afraid of pain? – That was yesterday. Today, modern means and methods take away every reason for being afraid of the dentist. We recommend various sedatives or anaesthetics – you choose what is right for you. Music not just for the ears. Feel free to let your thoughts drift away from the treatment while you listen to relaxing music. You get a CD player with a special, trance-inducing music library. 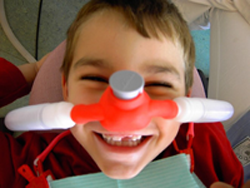 In many countries these days, most notably the USA, dental sedation with nitrous oxide is used on a daily basis. Due to its high level of safety, this treatment method is also especially well-suited to children and “anxious patients”. In many cases it manages to reduce the fear of both small and large patients, and create a relaxed treatment atmosphere. In the best cases, it creates a generally positive attitude to necessary dental treatments. If you wish, we can treat you under anesthetic in our procedure room especially equipped for this. You are not aware of the procedure and when you wake up it’s all over! This option is especially recommended for very anxious patients or if there are other general illnesses. Your dentists will look after you after the treatment too, and will be available for you even when you are back at home.